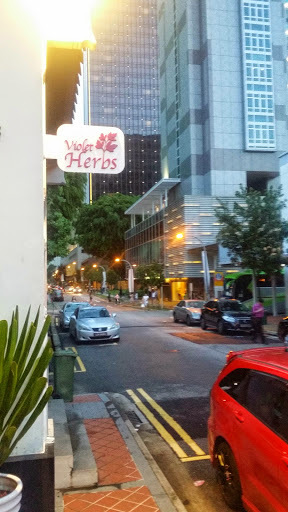 A session at Violet Herbs for food tasting was definitely a highlight for that week! Overall, the flavours tried and tasted were new (atleast to my buds, my taste buds) and they stuck true to Herbs as per their name. Good food comes with a price, but doesn’t have to be overpriced. Passion always shows in your work – like this experienced couple delivering such interesting concoctions infused with herbs. 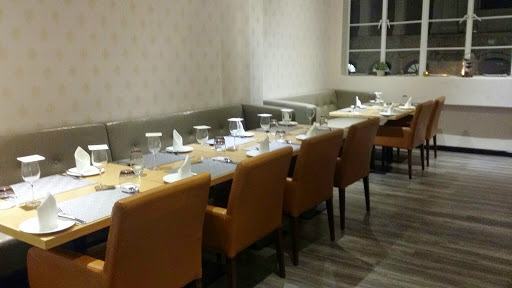 This restaurant is located “diagonally” opposite Orchid Hotel and along Tras Street (first after the grass patch) – so it’s easy to get to from Tanjong Pagar MRT Stations. 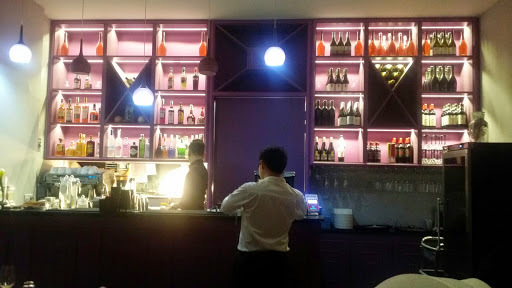 This French feat Modern European (a course meal diner with ala carte options) was opened in Dec 2014 by local couple, Dani and Chef Edward (previously at The American Club Singapore, Fish Market & Bistro and Restaurant Ember) with more than 22 years of combined experience in F&B, Singapore. Because it was a tasting session, we were treated to 6 dishes of sample size and a surprise Amuse Bouche of Beef to start the ball rolling. The name itself amused me – my great inexperience showing as I drew blank and had to ask what was that?! 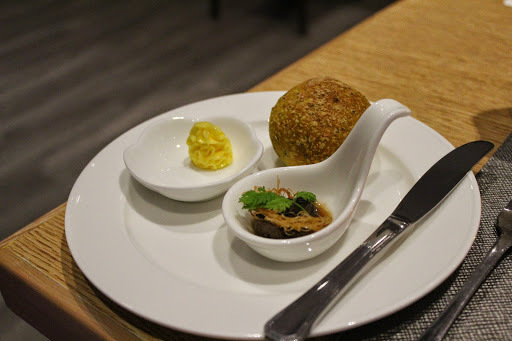 The Amuse Bouche, according to Wikipedia, is a single, bite-sized hors d’œuvre and different from appetizers in that they are not ordered from a menu by patrons, but, when served, are done so free and according to the chef’s selection alone. So, thank you Chef for serving up this aromatic dish. The beef was tender, easy on the palate and served with Madeira sauce and fried saffron strips. It was served with Saffron Bread which smelt so good and chewy in its thickness. First time trying a full-on Saffron Bread and it was delish! 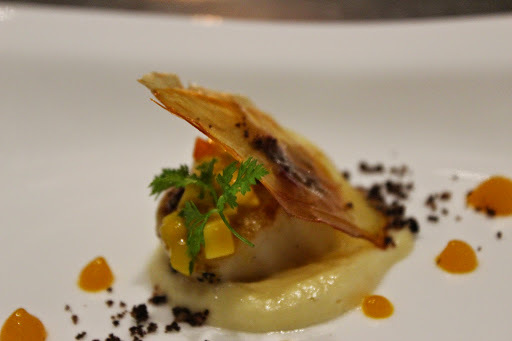 Next up – Mango Scallops served on Parsnip Puree topped with Mango Gel, a thin Potato Chip, Mango Salsa and Micro Herbs. I liked the Mango Salsa and the Gel is interesting (easily assumed as fish roe instead but it’s not). Parsnip Velouté. Parsnip… huh?! Velouté referes to thick soup. AH!!! 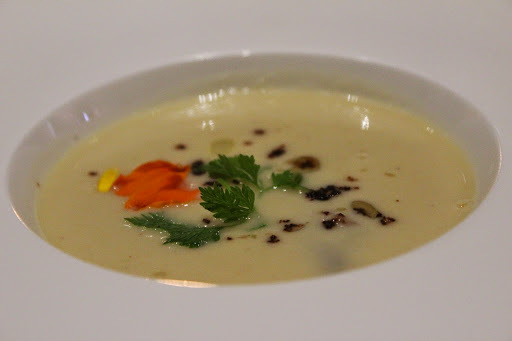 And so, this dish was a nice thick, creamy soup that was smooth with fresh Sri Lankan crab meat and drizzled with herb oil, fresh herbs, chocolate soil (crumble) and edible flower petals. A very rich comforting dish with subtle flavours! Truffle Foie Gras, Braised Kurobuta Pork Belly and Marinated Red Miso Cod were the lined up mains for us to sample. 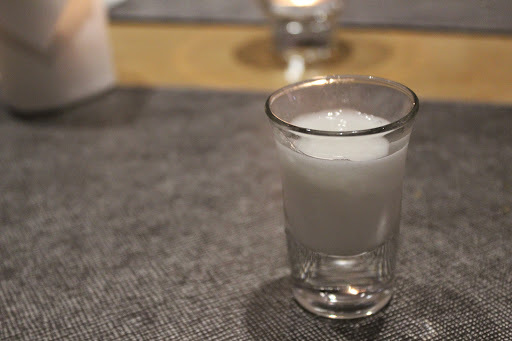 And between the first 2 mains we were given a Yuzu Sorbet to help clear our palates. Pretty smart move as both the dished have very distinct flavours that stick to your senses. I enjoyed savouring the Truffle Foie Gras amongst the 3 mains. Accompanied with poached egg, poached for 1 hour egg which gave the yolk a strong, thick yellow/orange tint and the white was silky smooth. 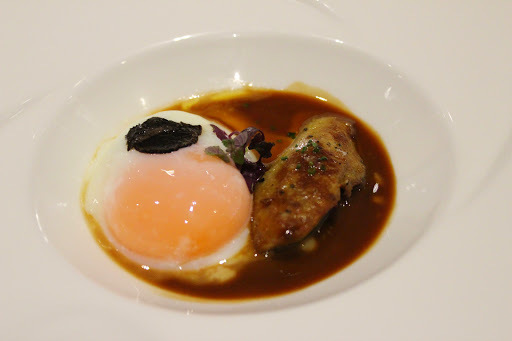 At the slice of the yolk, it blended well into the cepes reduction and summer black truffles. Summer Black Truffles which costs a pretty dime from what we heard! Check out that egg yolk below. 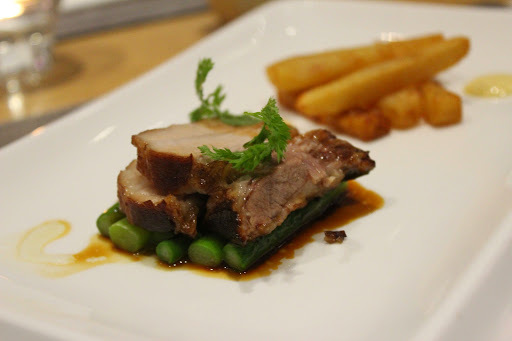 The Braised Kurobuta Pork Belly has a high fat marbling and melts away in your mouth (atleast in mine!). Served with homemade herb fries, spicy blood orange sauce, asparagus and micro herbs – I was just glad we were sharing this richness. 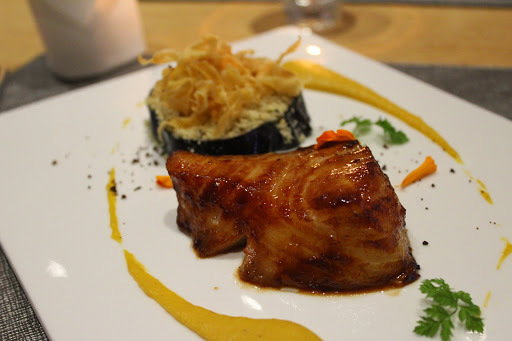 As I’m a confused fan of Seafood – the Marinated Red Miso Cod it was tender and not too sweet to me (only ‘cause I don’t particularly know how to enjoy fish) and of course… fishy. So you may want to check out the others’ opinions on this dish. Bring on the dessert – Frozen Nougat for a bittersweet and cooling ending. 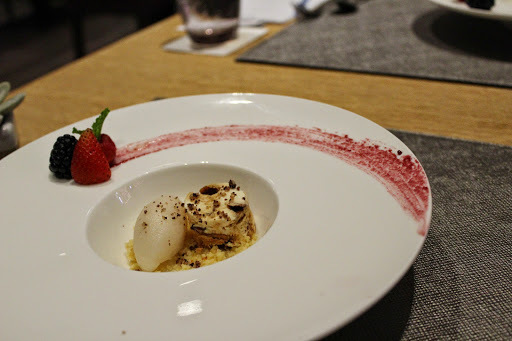 Served with raspberry sauce, mixed fruits/berries, chocolate soil, crumbles and lychee sorbet – it was a refresh end to our beautiful tasting night at Violet Herbs. I wanted seconds of this! Thank you #OpenRice & Violet Herbs for this session! Next Next post: Breakfast at Harry’s Boat Quay, why not?